Lloret de Mar, set along a wide bay in Spain's Catalonia province, is one of the favourite package-tour destinations along the Costa Brava. For decades, this resort has welcomed European tourists to its extensive Blue Flag beaches and its riotous nightlife. Mostly attracting the younger crowd between 18 and 30, the resort is geared towards affordability and a free-for-all atmosphere, with theme parks, discos, all-night bars and clubs, and very little in the way of peace and quiet. Many bars and hotels at Lloret de Mar have wide-screen televisions and regularly show European football matches and other sports events, at which over-consumption of alcohol is encouraged by the owners. Tourist information, if required, can be found at tourism offices and travel agencies around the resort, or simply obtained from your hotel's front desk. Lloret de Mar Beach functions as the resort's principal beach, fronting the Mediterranean Sea and coming with a number of large hotel complexes. Other beaches include Canyelles, Fenals, Sa Boadella and Santa Cristina, where various water sports are available, such as jet skiing, water skiing, wind surfing and parasailing. Families looking to get away from the beach for the day should consider spending time at the Waterworld (El Parc Aquàtic de la Costa Brava) theme park, where swimming pools, lagoons and exciting water slides are accompanied by a lazy river, miniature golf, picnicking facilities and its very own beach area. Formal sightseeing around Lloret de Mar comes in the form of the Parish Church, the La Verge de Gracia Chapel and the Town Hall, where a Neo-Classical bell tower is a particular highlight. With ocean views, the Santa Clotilde Gardens features pretty terraces and lots of colourful flowers, while if history is more your thing, then the archaeological remains unearthed at the ancient Montbarbat Iberian settlement will be quite fascinating, as will the ruins of the Puig de Castellet citadel. More information about Lloret de Mar Tourist Attractions. Away from the beaches and high-rise hotels of Lloret de Mar are some further remainders of the town's surprisingly rich heritage. Separating Lloret de Mar Beach from Fenals Beach is St. Joan's Castle Tower (Castell de Sant Joan), which dates from the 11th-century and was once attacked by a Napoleonic army. Close by is En Plaja's Castle, which was constructed in the latter part of the Spanish Civil War and is so pleasing to the eye that you will regularly see it framed on postcards and in tourist brochures. Other noteworthy sights to see around the town include the 19th-century Garriga Houses and Cabanyes Font House, the ancient Roman Sepulchre, and the much-photographed Fisherman's Wife statue, which stands next to the main beach and is shown waving to her loved one at sea. If you simply wish to explore the town, then a stroll around the charming narrow backstreets offers a stark contrast to the discos and considerably more touristy beachfront. More information about Lloret de Mar Landmarks and Monuments. Lloret de Mar is first and foremost a beach resort, although this part of the Costa Brava does contain more than a handful of cultural offerings, both here in the town and next-door in the suburb of Tossa de Mar. Containing information relating to the town's nautical and seafaring past is the Maritime Museum, which occupies an important 19th-century mansion and remembers how Lloret de Mar started its life as a small fishing village, evolving over the years to become a busy port town. At the Catalan Rural Museum, traditional rural life in this part of Catalonia is remembered through a series of old artefacts. Boasting a number of ancient relics dating back some 2,000 years - originating from the Iberian Puig de Castellet settlement, is the Verdaguer Cultural Centre. Close by, both the Tossa de Mar Municipal Museum and the Tossa de Mar Museum of Modern Art warrant mentioning as well. More information about Lloret de Mar Museums and Art Galleries. Catalonia comes with an array of old towns, villages and ancient sites, and therefore if you have chosen to hire a car, you may like to venture outside of Lloret de Mar for a day trip or two. The splendid and vibrant metropolis of Barcelona is little more than an hour away by road and comes with much Gaudi-style architecture and many splendid palaces, such as those located within its Barri Gòtic quarter. A little closer to Lloret de Mar is Girona, a historic town with a castle, fortified Old Quarter and lively Saturday market. To the north, the town of Figueres is best known for its rather extravagant architectural feast that is the Dali Theatre Museum, where renowned Catalan surrealist painter Salvador Dali is actually buried. Aimed at families on holiday on the Costa Brava, the Marineland Catalunya is a marine zoo with penguins, seals, dolphins and more. For a tranquil alternative to the beaches and tourism, both the Parc Natural del Cap de Creus and the Sa Riera Park are peaceful nature resorts filled with pathways and pleasant views. 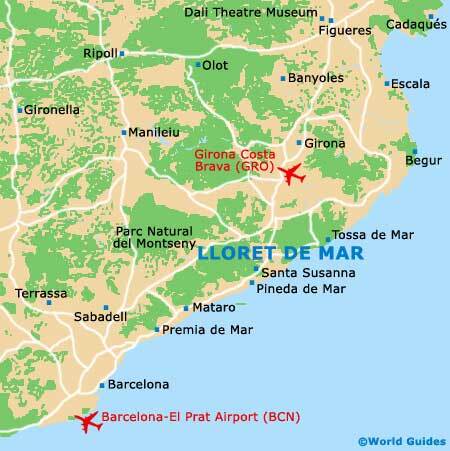 More information about Lloret de Mar Attractions Nearby.